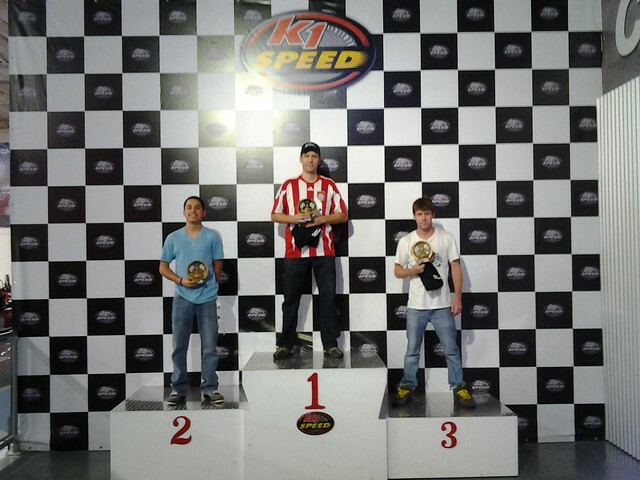 K1 Speed is giving you the opportunity to prove you are the fastest racer. The top 3 finishers could win tickets to the 2012 Austin GP, or a grand prize of a ride in a Formula GP Experience Jordan F1™ 3-seat race car – a $999.00 Value! Next stop K1 Speed Houston – Sunday, Oct. 21st. 7-10 pm. We have our Austin WINNERS!!! FORMULA GP EXPERIENCE GP PACKAGE – A thrilling ride in a Jordan F1, 3-seat formula race car at Austin Driveway, November 12, 2012. 2 TICKETS TO THE AUSTIN FORMULA 1 GP, NOV. 16-18, 2012. Tickets are for Turn 1 Grand Stands, and are good Saturday. 1 TICKET TO THE AUSTIN FORMULA 1 GP, NOV. 16-18, 2012. Ticket is for Turn 1 Grand Stands, and is good for Saturday. $75 ENTRANCE FEE: Includes 3 – 14 lap races in 3 different karts. AVERAGE OF 3 BEST LAPS, IN 3 DIFFERENT KARTS WILL DETERMINE THE WINNER. To reserve your spot, follow the link to register here. Or you can register at the center counter. *For drivers 16 years of age or older. Parent or guardian to sign waiver for first place winner if under the age of 18. First place winners to be maximum height 6’-4”, 250 lbs in order to receive free Formula GP Experience ride package. For more information on grand prize package, please visit www.formulagpexperience.com.